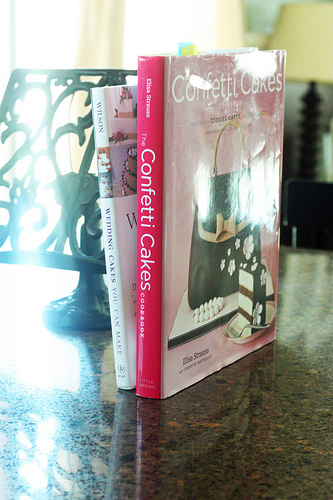 To start off this big ole project I started by looking in my very own library and pulled out these two fabulous books, Wedding Cakes you Can Make by Wilson and Confetti Cakes by Elisa S.. Both I recieved along with some other baking books last year for Mother’s Day! Wedding Cakes UCM, has the best timelines and shows you how to calculate how much of everything your going to need. Confetti Cakes, I used for all the recipes and the have some great pictures. All of her cakes have fondant so she has some great how to’s in there as well! 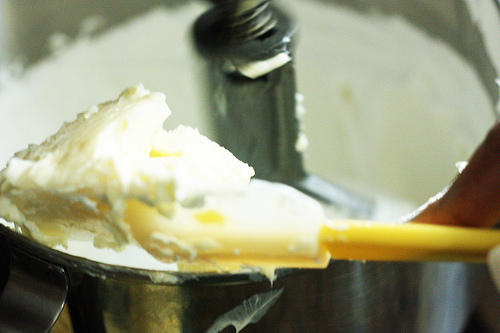 The butter is freshly made by hand, by me. The sugar is organic and so is the cream cheese. Until they looked like this! It kinda had the consitancy of goop/guck/ that stuff that sticks to the wall…you can buy it in the quarter machine, you know what I am talking about. Next part was a little intimidating at first but after the 50th batch you get use to it and its not a big deal! 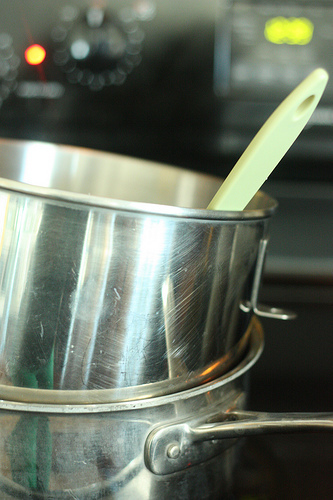 I removed the kitchen aid bowl from the mixer and I put it over a pot of boiling water. 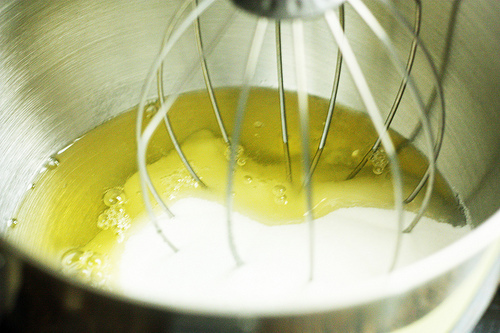 This is so that the egg whites are nice and hot..NOT COOKED…were not making scrambled eggs here girls! The recipe says that I need to heat it up until the sugar was dissolved and I could feel no sugar when I rubbed the mixture in between my fingers..so I did that BUT…..
Also make sure you scrap down the bowl to get any remaining crystals…..
Now the fun part…..whip on high high super high I think it might break speed for 10 minutes! Until it forms a STIFF peak…that means when you pull it up the peak doesen’t hunch over like it’s dead. Then you have this beautiful outcome…..mmm I just want one lick….please….pretty please. 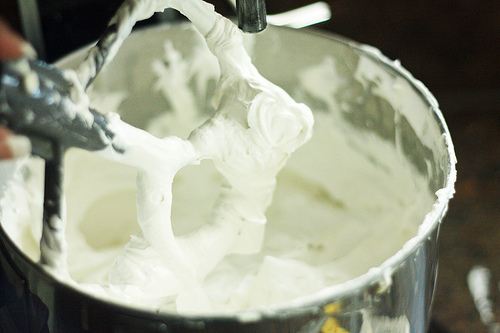 Now go ahead and lick…I mean scrap the whip attachment so as much as possible is back in the bowl. 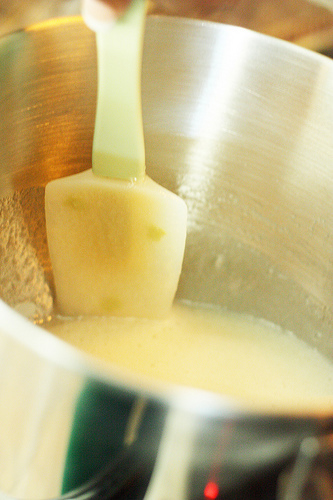 Then switch it to the paddle attachment….the one we use like 90% of the time….and turn the mixer back on to low speed and slowly add the butter…Mix until fluffly. 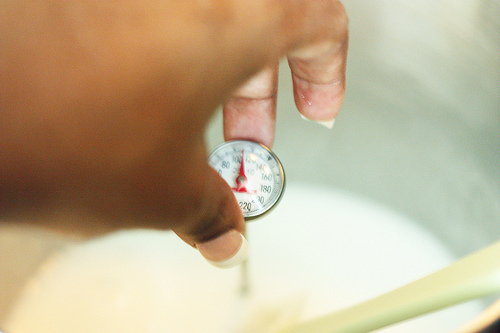 Add the vanilla…not like this….. use a measuring cup. I’m just a really good estimater..I got it like that. still not right? Keep going! Ok after about 15 mintues it should be good! At this point you can now add the cream cheese or any other varations you choose…. Mmm…Nice. 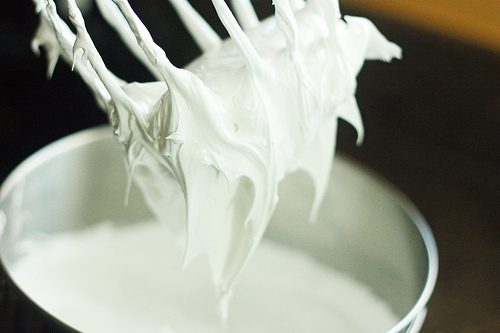 Perfect and stable Buttercream! 1. Its alot more fancier for the ocassion. If the wedding cake was going to be outside I would have used something else, but it’s going to be in a cool air-conditioned room so I won’t have to worry about it melting like the wicked witch of the west. See….not all wedding cake are created equal. 2.This frosting TASTE 10 x better!!! 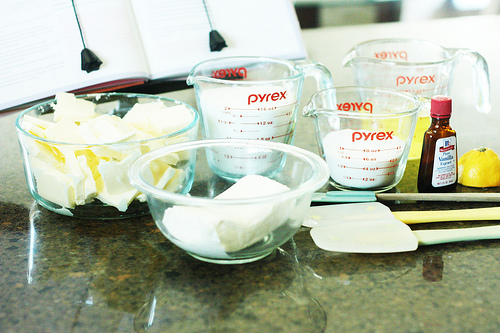 Stay tune for Day 2: Baking the Cakes!!!! You are too cute! I love the way you took the pictures during the entire process. It sounds delicious! So you are making wedding cakes now?? How fun! I cannot wait to try this! 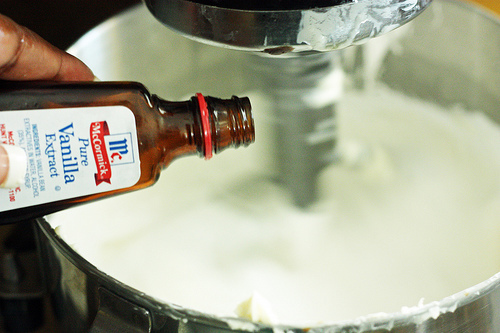 Do you really use 1/4 cup of vanilla?